It's around this time of the year that the toll of the year starts to set in - 10+ months of hectic, long-hour days that can roll into night. All I feel like doing is sitting down with lots of cake and lots of tea. I prefer making my own cakes (unless I'm feeling exceptionally lazy) and have been trying to make them healthier by substituting flour for almond meal, especially when I know I'll be consuming a significant amount myself. More nutritious baked goods? Yes please! The people at Lucky Nuts must have known of my intentions and generously sent me an early Christmas present; lots and lots of Australian grown nut products perfectly suited for baking lots of goodies. While almond based products make up the majority of their range, hazelnuts, walnuts and pine nuts also made an appearance. Having seen (and purchased) their products in the past, I'm aware that they also have cashews, brazil nuts, pistachios, macadamias and even non-nut sunflower seeds and pepitas. I must admit that I always have a massive backlog of recipes to get through, but I'll never say no to adding more to my collection. Not only can you download the recipe book that I received, but there are step-by-step instructional videos too! Having a range of quality nuts and pre-ground nut flours was exceptionally handy. It meant that I could make a healthy snack/meal/dessert whenever the mood took me. Needless to say, it wasn't long before I dug into my stash (breakfast the next day if you were wondering). What was on the menu? 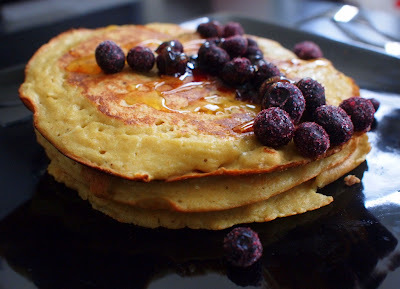 Rich and healthy Almond and Coconut Pancakes for the perfect start to the day. As good as breakfast is, there are only a few people that you can share a home-cooked breakfast with. Cakes are much easier to share around - like this gorgeously dense Venetian Almond and Carrot Cake. My first success with macarons was thanks to Lucky Nuts - having finely ground almond flour probably had something to do with it. What would you make with the range of quality Lucky Nut products? Christmas cookies? Hearty brownies? What about the cheesecake from their website? Me, I'm eyeing some Salted Caramel Almond Tarts to share around. Thanks to these quality products, I'm predicting the tarts will turn out splendidly. If you have a recipe to share, Lucky Nuts might even add it to their website - how's that for spreading the Christmas spirit of giving around? Thanks again to Lucky Nuts and Nuffnang for generously sending me the products to try.